In this gripping memoir, perfect for true crime fans, former San Francisco 49er Kermit Alexander recounts his thirty-year-journey to redemption after the brutal and senseless murder of his family in South Central Los Angeles. “A deeply moving story of one man’s pain and hard-won peace” (Booklist, starred review). With vivid detail, former NFL All Pro and president of the NFL Players Association Kermit Alexander tells, for the first time, the full story of the senseless murders that took the lives of his mother, sister, and nephews. 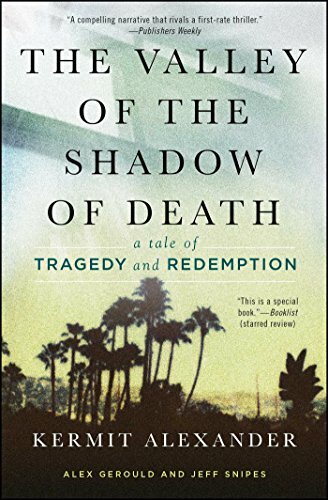 Part murder mystery, part redemption tale, and a fascinating history of Los Angeles, The Valley of the Shadow of Death begins when Kermit’s father moves the family from Louisiana to Los Angeles. After his storied career with the San Francisco 49ers, the Los Angeles Rams, and the Philadelphia Eagles, Kermit returned to LA and lived a short drive from his beloved mother. But the inexplicable slaughter in 1984 of Kermit’s family changed his life. He recounts the hours leading up to the massacre, and the tragic aftermath as he loses himself in the LA underworld trying to find answers. He describes his journey through the “wilderness” of despair—the years of isolation living out of his car, broke, depressed, and ill. Kermit opens up about his darkest hours and what it took to turn his life around, rebuild his family, and ultimately find peace. Ominous and intense, powerful and uplifting, The Valley of the Shadow of Death is a testament to the value of family and the resiliency of the human spirit.